If, after confirmation of the booking, you would like to make some alterations to the booking, AfriCamps is not obliged to satisfy these requests. It is at the discretion of AfriCamps whether, and to what extent, these alterations can and will be accepted. We require confirmation in writing of your intention to make any changes to your existing booking. For each modification in a booking already made, up to a maximum of 1 month before arrival, we will charge a once off alteration fee of R250,-.These costs will not be charged if you add a booking or change to a more expensive period. In the case of an alteration to a cheaper period or (partial) cancellation within one month before arrival, you are chargeable for a percentage of, or for the entire booking amount (see cancellation policy). If, after confirmation of the booking of more than one tent, you want to reduce the number of booked tents, the cancellation policy will be applicable. In principle, alterations cannot be permitted one month prior to arrival. In the event of a cancellation more than a month before arrival 50% of the rental amount is payable. In the event of cancellation within a month before arrival the entire booking amount is payable. In the case of premature termination of the stay, the entire booking amount is payable. Take the N1 to Worcester. From Worcester take the R60 to Montagu. From Montagu take the R62 and continue on the R62 through the towns of Barrydale, Ladismith and Calitzdorp to reach the town of Oudtshoorn. As you enter the town of Oudtshoorn continue straight on until you reach Baron van Reede Street (at the 3rd traffic light). Turn left into Baron van Reede Street (at the 3rd traffic light) and continue straight on this main road to the Cango Caves for +-2km. As you past the Cango Wildlife Ranch & Riempie Retirement Village on your left – AfriCamps Klein Karoo entrance would be on your right. Take the N12 over the Outeniqua pass and follow the road signs to Oudtshoorn. As you enter the town of Oudtshoorn, continue straight on the main road to the Cango Caves +-2km. As you past the Cango Wildlife Ranch & Riempie Retirement Village on your left – AfriCamps Klein Karoo entrance would be on your right. Take the N12 from Beaufort West through Meiringspoort and the town of De Rust to Oudtshoorn. As you enter the town of Oudtshoorn continue straight on until you reach Baron van Reede Street (at the 3rd traffic light). Turn right into Baron van Reede Street (at the 3rd traffic light) and continue straight on the main road to the Cango Caves for +- 2km. As you past the Cango Wildlife Ranch & Riempie Retirement Village on your left – AfriCamps Klein Karoo entrance would be on your right. Set on one of the biggest working Ostrich farms in Southern Africa, this AfriCamps location is one to experience. Besides the Ostriches a big portion of the farm has been made available to a wide variety of free-roaming game. It is that part of the farm where you will find 5 luxury boutique camping tents positioned around a big water dam. 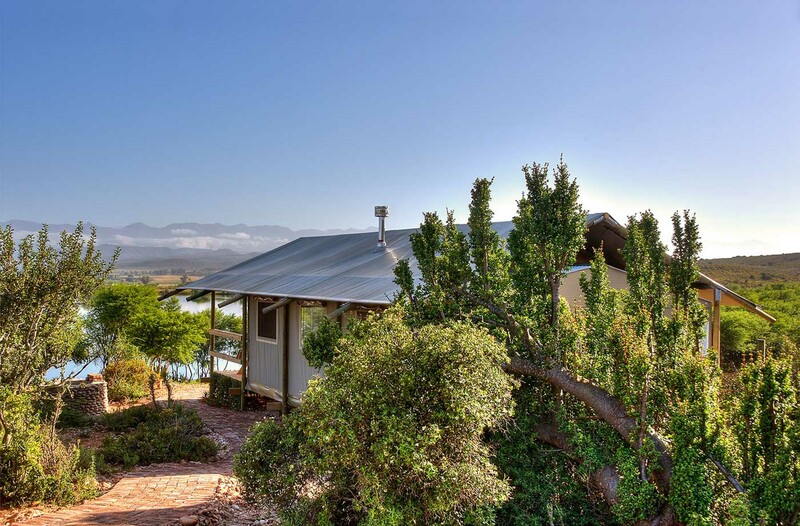 Located only a 10 minutes’ drive from Oudtshoorn center, in the middle of a pristine Karoo landscape with direct views of the Swartberg Mountains, AfriCamps Klein Karoo offers you the perfect backdrop to relax in the tranquil surroundings of this serene majestic farm. Both bedrooms are furnished with a queen size bed and have their own private entrance which allows maximum privacy. One of the bedrooms also contains an extra single bunk bed, so the tent will comfortably sleep a family of 5. Tents are equipped with an air conditioning unit to keep you cool during those hot summer nights and a private bathroom with a hot shower cabin, washbasin and flushing toilet.